In fiber-optic communications, WDM (wavelength-division multiplexing) is a technology which multiplexes a number of optical carrier signals onto a single optical fiber by using different wavelengths (i.e., colors) of laser light. This technique enables bidirectional communications over one strand of fiber as well as multiplication of capacity. Generally, WDM technology is applied to an optical carrier which is typically described by its wavelength. WDM system uses a multiplexer at the transmitter to join the signals together, and a demultiplexer at the receiver to split the signals apart (see Figure 1). WDM system is very popular in the telecommunication industry because it allows the capacity of the network to be expanded without laying more fiber. By utilizing WDM and optical amplifiers, users can accommodate several generations of technology development in their optical infrastructure without having to overhaul the backbone network. Moreover, the capacity of a given link can be expanded simply by upgrading the multiplexers and demultiplexers at each end. WDM could be divided into CWDM (coarse wavelength division multiplexing) and DWDM (dense wavelength division multiplexing). DWDM and CWDM are based on the same concept of using multiple wavelengths of light on a single fiber but differ in the spacing of the wavelengths, number of channels, and the ability to amplify the multiplexed signals in the optical space. Below part will introduce some differences between CWDM and DWDM system. CWDM provides 8 channels with 8 wavelengths (from 1470nm through 1610nm) with a channel spacing of 20nm. While DWDM can accommodate 40, 80 or even 160 wavelengths with narrower wavelength spans which are as small as 0.8nm, 0.4nm or even 0.2nm (see Figure 2). DWDM multiplexing system is capable of having a longer haul transmittal by keeping the wavelengths tightly packed. It can transmit more data over a larger run of cable with less interference than CWDM system. CWDM system cannot transmit data over long distance as the wavelengths are not amplified. Usually, CWDM can transmit data up to 100 miles (160km). The power requirements for DWDM are significantly higher. For instance, DWDM lasers are temperature-stabilized with Peltier coolers integrated into their module package. The cooler along with associated monitor and control circuitry consumes around 4W per wavelength. Meanwhile, an uncooled CWDM laser transmitter uses about 0.5W of power. To sum up, CWDM and DWDM have different features. Choosing CWDM or DWDM is a difficult decision. We should first understand the differences between them. 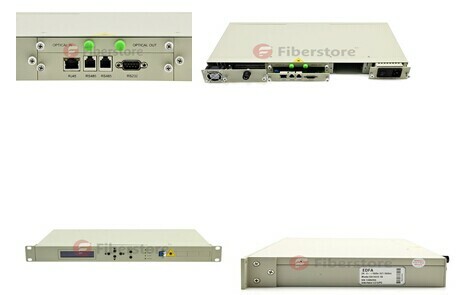 Fiberstore has various kinds of WDM products, such as 10GBASE DWDM, 40 channel DWDM Mux, CWDM Mux/Demux module and so on. It is an excellent option for choosing CWDM and DWDM equipment. Wavelength division multiplexing (WDM) is a technology or technique modulating numerous data streams, i.e. optical carrier signals of varying wavelengths (colors) of laser light, onto a single optical fiber. The goal of WDM is to have a signal not to interfere with each other. It is usually used to make data transmission more efficiently. It has also been proven more cost effective in many applications, such as WDM network applications, broadband network application and fiber to the home (FTTH) applications and so on. According to channel spacing between neighbored wavelengths, there are two main types of WDM: Coarse WDM (CWDM) and Dense WDM (DWDM). Though both of them belong to WDM technology, they are quite different. We can differentiate them from the definition, data capacity, cable cost and transmission distance. CWDM is defined by wavelengths and has wide-range channel spacing. DWDM is defined by frequencies and has narrow channel spacing. CWDM is a method of combining multiple signals on laser beams at various wavelengths for transmission along fiber optic cables, such that the number of channels is fewer than in DWDM but more than in standard WDM. “Course” means the channel spacing is 20 nm with a working channel passband of +/-6.5 nm from the wavelengths center. From 1270 nm to 1610 nm, there are 18 individual wavelengths separated by 20nm spacing. DWDM is a technology that puts data from different sources together on an optical fiber, with each signal carried at the same time on its own separate light wavelength. “Dense” refers to the very narrow channel spacing measured in Gigahertz (GHz) as opposed to nanometer (nm). DWDM typically uses channel spacing of 100 GHz with a working channel passband of +/-12.5 GHz from the wavelengths center. It uses 200GHz spacing essentially skipping every other channel in the DWDM grid. And it has also gone one step further using an Optical Interleaver to get down to 50GHz spacing doubling the channels’ capacity from 100GHz spacing. In fiber optic network system, DWDM system could fit more than 40 different data streams in the same amount of fiber used for two data streams in a CWDM system. In some cases, CWDM system can perform many of the same tasks compared to DWDM. Despite the lower transmission of data through a CWDM system, these are still viable options for fiber optic data transmission. CWDM system carries less data, but the cabling used to run them is less expensive and less complex. A DWDM system has much denser cabling and can carry a significantly larger amount of data, but it can be cost prohibitive, especially where there is necessary to have a large amount of cabling in an application. DWDM system is used for a longer-haul transmission through keeping the wavelengths tightly packed. It can transmit more data over a significantly larger run of cable with less interference. However, CWDM system cannot travel long distances because the wavelengths are not amplified, and therefore CWDM is limited in its functionality over longer distances. If we need to transmit the data over a very long range, DWDM system solution may be the best choice in terms of functionality of the data transmission as well as the lessened interference over the longer distances that the wavelengths must travel. As far as cost is concerned, when required to provide signal amplification about 100 miles (160 km), CWDM system is the best solution for short runs.